Ardiente is a 788-home active adult community in North Las Vegas, Nevada. This beautiful community boasts an impressive list of amenities, including a clubhouse with two outdoor pools and a state-of-the-art fitness center. The community was originally started by Centex Homes in 2005 but was acquired by Shea Homes in 2010 who will complete the community under their popular active adult brand. Residents enjoy everything from a 24-hour guard-gated entry to community gardens, a full-amenity clubhouse and a selection of stylish, energy-efficient home plans. Six uniquely landscaped parks, like the rose garden and dog park, weave together via an extensive network of pedestrian paths, creating an idyllic and comfortable community with modern homes. At the heart of Ardiente is the 20,000 square-foot clubhouse, where neighbors become lifelong friends. Featuring open, finely detailed Spanish-styled architecture, a fully equipped, state-of-the-art fitness center, billiards and card rooms, the clubhouse at Ardiente will make you feel like you're on a permanent vacation. The clubhouse also features a catering kitchen for community gatherings, a library for discovering your new favorite book, and a large multi-purpose room for attending your favorite club. The long list of amenities continue outdoors, allowing residents the ability to enjoy the terrific year-round Nevada climate. You can go through a new exercise routine everyday of the week by playing a game on the tennis court, shooting some hoops on the basketball court or going for a run through the community's system of walking and biking trails and stopping at one of twenty four fitness stations. There are also several outdoor common areas throughout the community's grounds, including a BBQ area, an event lawn, and an outdoor patio for relaxing with friends during pleasant evenings. There are a variety of housing styles to choose from in Ardiente. Centex Homes began construction of the community in 2005 and offered eight single-story plans ranging from 1,235 to 2,352 square feet. These homes are now available on a resale-only basis. The largest of these plans has an optional second story loft or bedroom with a total of 2,832 square feet. These homes feature two to four bedrooms, two or three bathrooms, and an attached two-car garage. Ardiente was acquired by Shea Homes in 2010 and introduced single-family floor plans that range in size from 1,218 to 2,559 square feet. The homes are Shea Green Certified and include a number of eco-friendly features standard on their homes. The Shea models have two to four bedrooms, two to three bathrooms, and an attached two to three-car garage. Wide a wide range of options, Ardent can satisfy the active adults looking to downsize or those who want a more luxurious home. True to all Shea Homes' active adult communities, life in Ardiente is a never ending array of fun and activities. Whether you prefer to lounge by the pool and soak up the sun or stay active in clubs that include everything from arts and crafts to golf there is something for everyone here. A full-time activities director is on hand to continually create activities and groups. For sports-minded residents, Ardiente can take part in the tennis club, the walking group, or get their morning exercise in with a yoga class. More creative-oriented residents will love viewing the community talent show when not involved in the gardening or book club. Frequent happy hours, movie nights, and holiday parties make meeting new friends as easy as walking to the clubhouse. 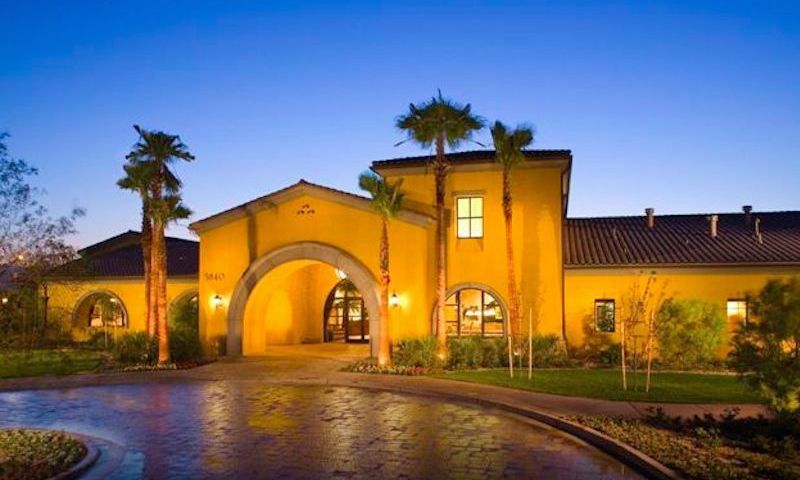 Situated in North Las Vegas, Nevada, Ardiente is close to all of the conveniences of the Las Vegas area. McCarren International Airport is approximately eighteen miles away and the entrance to I-15 is down the street, making international and local trips a breeze. Additionally, the Shadow Creek Golf Course, designed by the legendary Tom Fazio, is less than three miles away. The glittering lights of the Strip are just 20 minutes to the south. The area around the community continues to grow and offers a variety of restaurants, coffee shops and shopping centers , creating all the conveniences of downtown Las Vegas without the crowds. With all of the amenities, the beautiful homes, and an incredibly dynamic area, active adults in Las Vegas would be proud to call Ardiente home. Clubhouse - 20,000 Sq. Ft. There are plenty of activities available in Ardiente. Here is a sample of some of the clubs, activities and classes offered here. The Riviera Collection offers three open floor plans for the downsizing active adult. These homes offer from 1,218 to 1,426 square feet and are great for entertaining or hosting out-of-town guests. They come with two to three bedrooms, two bathrooms, and an attached two-car garage. Centex Homes started construction of Ardiente in 2005. They offered eight single-family floor plans and built approximately 280 homes before being acquired by Shea Homes in 2010. The Centex floor plans are now only available on a resale-only basis. Ranging in size from 1,235 to 2,352 square feet, these homes have two to four bedrooms, two bathrooms, and an attached two-car garage. The Monte Carlo homes provide some extra space to spread out and relax. These homes range in size from 1,437 to 1,741 square feet and feature two bedrooms, two bathrooms, and an attached two-car garage. Some models come with an additional den for the ideal getaway, office or hobby room. For homeowners who want space and luxury, the Portofino Collections is the answer. These homes offer from 1,881 to 2,444 square feet of living space. These homes have two to four bedrooms, two to three bathrooms, and an attached two to three-car garage, making them great for entertaining or hosting out-of-town guests. fantastic place to live and enjoy retirement !!!! Our home is very well built and with full solar, spacious and private living . The grounds, clubhouse and parks are kept very very clean. Neighbors are great, lots of clubs and activities. So glad we decided on Ardiente oh yeah living the good life here !!! We moved here in October of 2017 and I could not be more pleased with our purchase. The community is everything I thought it would be and more. Ellen Kaptain was our Realtor and did a fantastic job for us. The Club House is fantastic and while I have yet to use the pool, I can not wait for summer. It is smaller than the other 55 and older communities, but that is a plus. Everyone you meet is so friendly and helpful.I can only see me leaving here when I go feet first. 55 Places website was so easy to find when I started my search for a new home. I love everything about Ardiente, the people, the facility, the activities and most important I feel secure and finally at home. Great place to live. It's an active and fun community. Pickleball twice a week with four courts. Great clubhouse with wifi, kitchen, awesome gym, steam sauna, two heated pools plus a jacuzzi, 2 outdoor barbque gas grills for residents near covered area by pool. Lots of community scheduled activities, and geographically near lots of fun places. We have one of the newer homes built by Shea and we're really happy with it. The prices are affordable and the homes are really well built. We use the clubhouse often and we are involved with (or have at least tried) lots of different clubs like the poker club, dominoes and pickleball. I kind of wish we had a golf course on-site but of course there are plenty of other courses in the area to play and we do have a nice putting green here. 55places.com is not affiliated with the developer(s) or homeowners association of Ardiente. The information you submit is distributed to a 55places.com Partner Agent, who is a licensed real estate agent. The information regarding Ardiente has not been verified or approved by the developer or homeowners association. Please verify all information prior to purchasing. 55places.com is not responsible for any errors regarding the information displayed on this website.